This cartoon appeared in the New Yorker in 1993. Today, I’ll be presenting at ECU’s celebration of International Women’s Day. The panel is on social media, and I’m focusing how we can make better use of the Internet when we avoid assuming that it is a necessarily democratizing, unembodied medium. It’s an informal talk aimed at undergraduates and followed by roundtable discussion, so I’m including just my notes–a sort of general outline–below. I’m very excited to hear what people have to say! My hope for this panel is that we’ll be able to come up with productive and positive uses of the Internet. (My co-presenters are already doing some of that important work). But in order to do that, we need to be smart and critical, and that means also paying attention to the ways in which Internet technologies can be used for less than positive purposes. This is like learning from history; we need to be aware of what doesn’t work so that we can avoid it. Perhaps even more importantly, we need to be paying attention to how the Internet makes us think—what patterns of thought this tool (the Internet) inculcates in us. Our own privileges—one of which is access to the Internet—can lead us to ideas about the Internet that are dangerous. Most specifically, I’m talking about the idea that we are all equal online. 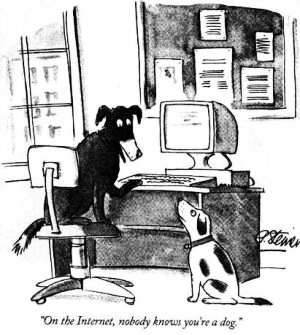 There’s a famous one-frame cartoon that was published in The New Yorker in 1993 that shows two dogs sitting in front of a home computer, and one is saying to the other, “On the Internet, nobody knows you’re a dog.” So, the idea here is that online access breaks down barriers. It creates a space where we’re all equal. We don’t have bodies online—we’re represented through code that we create, directly or indirectly—so our bodies can’t betray us. We can choose how to represent ourselves in ways that our bodies don’t always allow for in RL (real life). In other words, Internet technologies allow us to leave embodiment behind. There’s a long tradition aimed at theorizing this brain-body split; think Plato’s Allegory of the Cave or Descartes’ Meditations on First Philosophy. With the advent of the Internet, some people think the brain-body split has happened. I refer to this kind of thinking—this pattern of thought—as thinking of the Internet as a democratizing medium. It’s a medium that leads us to democracy—a place where everyone has an equal voice. The Internet is not and never has been a neutral space. Arpanet, the Internet’s predecesor, was developed by the US Department of Defense, which is not a neutral entity. Further, discussions of net neutrality now abound; if the Internet were always already neutral, we wouldn’t have to have these conversations. The Internet doesn’t erase autocolonization. You can never really leave your body behind, because the mind and body are always connected. You know that you have a body. That body has always already affected how you interact with the world by the time you can interact with a computer screen. If you are your own audience, you already know the ways in which you have historically been privileged and oppressed. The fact that you’re looking at a screen instead of another human doesn’t change that. Your brain is gendered. It will always produce data that is inflected by your embodied experiences. For example, you are going to give away some markers of your gender. It could be what you’re interested in or how you talk (Deborah Tannen talks about how women tend to hedge because that’s what we’re taught to do); it could be how you identify or how you purposely don’t identify. Regardless of what actions you take, others are going to make assumptions about your gender—because they know you are a human being and you have a body. Others will gender you. Sometimes, people already know your identity on the Internet. In my career as a newspaper reporter, my embodied reality was certainly a factor in how people responded in online comments. Further, identifying as a feminist in an online space almost always results in participants assuming you are female. No matter what you do online, other people will make it a gendered space. Finally, even if we assume this pattern of thought is true—the Internet makes us equal—I don’t think that’s a good thing. What does it say about a culture if it has to disembody its people in order to get them to treat each other equitably? Rather, we should focus on equality/justice in RL and on turning the Internet into a positive medium for doing activist work. The Internet is a medium like any other. It hosts positive communities and ones where bullying and oppression occurs, and most will have a mix of these attributes. What this means is that this is a call to action. It’s up to us—users of the Internet—to use the Internet to our advantage. It’s up to us to think about it critically, to pay attention to the patterns of thought Internet technologies create, and to use it to improve the lot of women, girls, and other oppressed people—people who don’t have the access that we do. How can we use the Internet to create spaces of empowerment for women and girls? How can we remind ourselves and talk to others about the complexity of the Internet, so that we don’t fall into unproductive patterns of thought? What are some ways we can educate ourselves to better use the Internet?